Moscow and Beijing have sent a clear signal of support to small and medium-sized enterprises. At a recent Russian-Chinese forum, the parties agreed to establish a system to allow companies to search for business partners. Furthermore, an exhibition platform for Russian goods is to be established in Harbin, in northern China. Russia and China have taken steps toward the establishment of a system to support small and medium-sized businesses in their search for new partners. At a Russian-Chinese forum titled "Big opportunities for small- and medium-sized enterprises" held in Beijing on April 21-22, First Vice Premier Zhang Gaoli said that the development of small and medium businesses is of strategic importance in cooperation between China and Russia against the backdrop of slowing economies around the world. According to Gaoli, small and medium enterprises (SMEs) in China contribute up to 60 percent to the country's GDP, and accounted for 8 percent of job growth last year. Russian Deputy Prime Minister Arkady Dvorkovich stressed that since 2010 China has been the largest trading partner of Russia, whose share in foreign trade is about 11 per cent. The bilateral trade should reach $100 billion in the coming years and $200 billion by 2020. According to Dvorkovich, SMEs generate 25 percent of GDP in Russia, providing employment to about 18 million people. The deputy prime minister noted that the forum was attended by over 500 entrepreneurs from 10 provinces in China and 320 businessmen from 38 regions of Russia, which could not but make him happy, he said. The forum participants discussed, among other things, the obstacles to cooperation between Russian and Chinese businessmen. The language barrier was singled out as one of the most important. Suggestions were made to use special software and computer applications for communication between businessmen at the forum, but learning each other's language still seems to be the most effective. The distrust of Chinese businessmen, rooted in the 1990s, remains another, no less serious obstacle. "Many Chinese people came to Russia then and returned with losses or with no money," said the chairwoman of the Association of Chinese Entrepreneurs in Russia, Cai Guiru. However, she tends to blame Chinese businessmen themselves for these failures. "They suffered a collapse in business not because of Russia's poor business climate, but because you should be prepared for your arrival in a foreign market, rather than wait for an easy and immediate profit," Cai Guiru explained. The daughter of Deng Xiaoping, the man credited for China’s “economic miracle,” Deng Rong, who is the deputy chairman of the China-Russia Friendship Committee for Peace and Development, also took part in the forum. According to her, Russian-Chinese relations are at a high level, but there is an objective to expand the scale and increase the level of economic cooperation. According to Boris Titov, chairman of the Russian part of the Russian-Chinese Committee of Friendship, Peace and Development and the Presidential Commissioner for Entrepreneurs' Rights, the forum also saw the signing of an agreement on the establishment of two systems aimed at helping businessmen from the two countries to find potential partners. "One system operates through the China Overseas Development Association, which supports Chinese enterprises abroad bringing together Chinese investors. Its office will be opened in Moscow, and it can be turned to in order to find a Chinese investor,” said Titov. “On the other hand, we won the tender to create a so-called docking system for small companies. This is an international network that already exists in Europe. Now we are creating it for APEC (the Asia-Pacific Economic Cooperation) and primarily for Russia and China. The system will be fed with data about a huge number of small businesses,” he said, explaining that the network would feature 60 centers in Russia and 100 in China. In addition, a number of other practical decisions were taken at the forum, including the creation of a special exhibition platform for Russian goods in the northern Chinese city of Harbin. 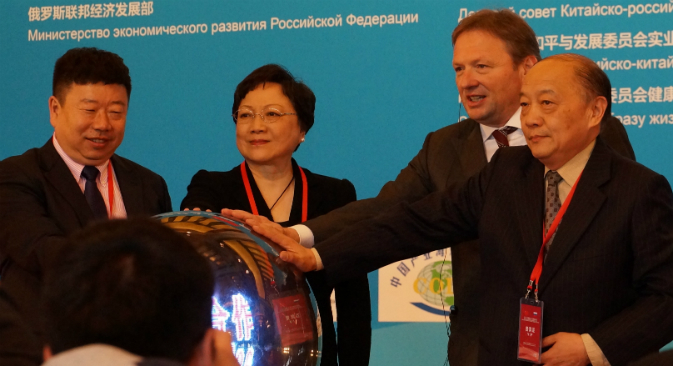 "All Russian producers of goods and services will be able to present them in a special exhibition hall, and they will be promoted through a specially designed marketing system in China," Titov said after making the announcement at the forum's closing session. The next forum, according to Titov, will be held next year and, in all probability, in Russia’s Black Sea resort of Sochi.